Cotton's Garden is a new Sunday market for streetfood, drinks and stalls, just Kinglsnad Road, on the opposite site to Catch Bar and Jaguar Bags. It's open from noon until 6pm, and will be running every Sunday until early August. 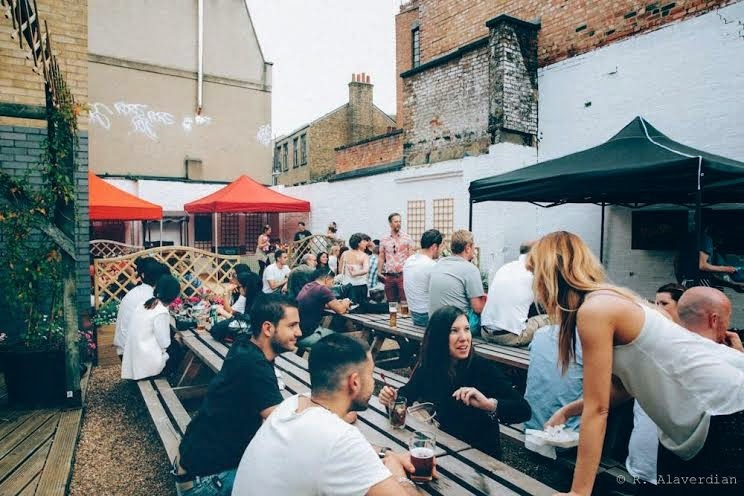 "A short walk from Columbia Rd flower market, tucked away from the hustle and bustle of Kingsland Rd, Cotton’s Garden is a new market in the heart of Shoreditch every Sunday from now until the end of August. Part outdoors on a terrace , part inside, we turn the arches of a late bar into a day market. Cotton’s Garden at Rolling Stock, is the perfect place to eat, drink, relax and shop in an intimate, friendly atmosphere this summer. Street food - outdoors in the garden, a revolving showcase of high-end street food from around the world – including vegetarian options, a summer residency from new start-up Stick'em Up (bringing Asian-inspired food-on-stick eating to London) and Sucrette (French patisserie serving home-made canelés, macaroons and lemon meringue tart). Jewellery and clothing - vintage designer and previously loved clothing stalls. All ages welcome, pet friendly"